I love all of the holiday party food this time of year, but I especially love the appetizers! However, when I see a cheeseball being served at a party, I usually don’t eat any. I always feel a little awkward digging into this giant ball of cheese with a cracker or a spoon, especially when there are people behind me in line! Maybe I’m weird, but it’s true. 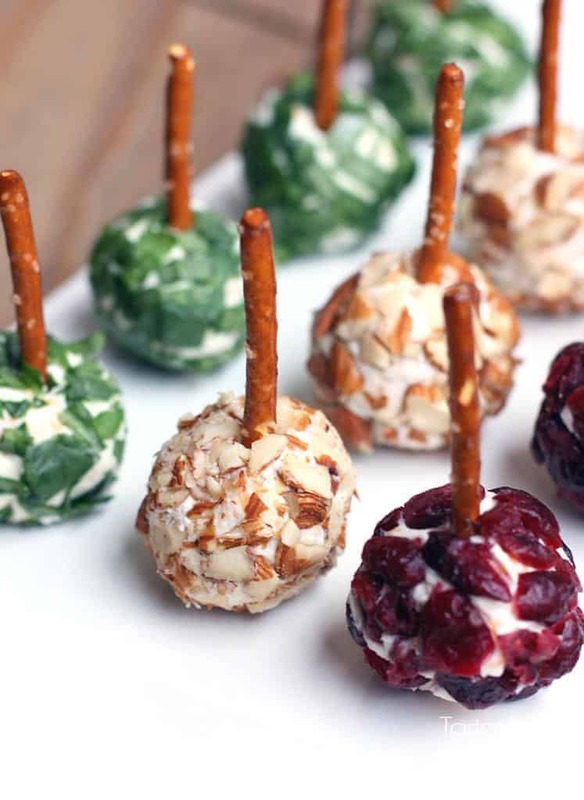 Then, I saw this amazing idea on Pinterest–cheeseball hacking problem solved! 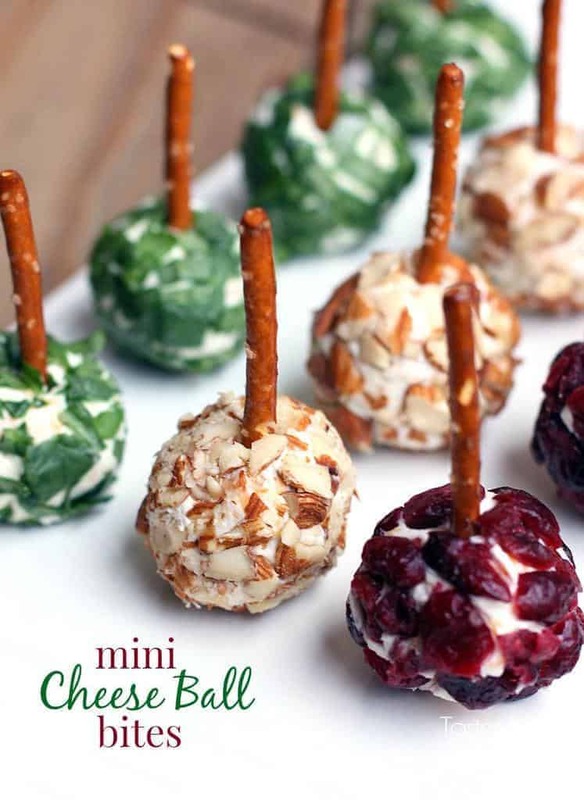 These little mini cheese ball bites are not only cute, they’re totally practical. You can still serve them with crackers on the side, and they’re super easy for guests to enjoy! I made one cheeseball recipe, divided it into 12 portions, and coated them in nuts, dried cranberries, and green onion or parsley. 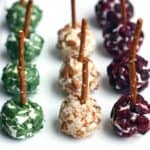 Mini Cheese Ball Bites are the perfect party appetizer that's easier to eat and more practical then a large cheese ball! In a medium bowl add the butter, cream cheese, lemon juice, Worcestershire sauce, hot sauce, and ground pepper. Beat with an electric mixer until well combined and smooth. Stir in cheddar cheese. Use a spoon to divide the mixture into 12-15 tablespoon-size portions. Dip your clean hands in a little bit of water and smooth each portion into a small ball. Refrigerate for at least 30 minutes (or as long as you want to in advance). Before serving, roll the balls in cranberries, nuts, parsley or green onion. Place a pretzel stick in each. Serve immediately. Make Ahead Tip: The cheese balls can be made a day in advance. Make them as instructed, but don't add the pretzels until right before serving. These are so cute! They look tasty too. Can’t wait to make them for a party on Wednesday. I seriously love cheese balls! I always make them as appetizers for get together’s or holidays. 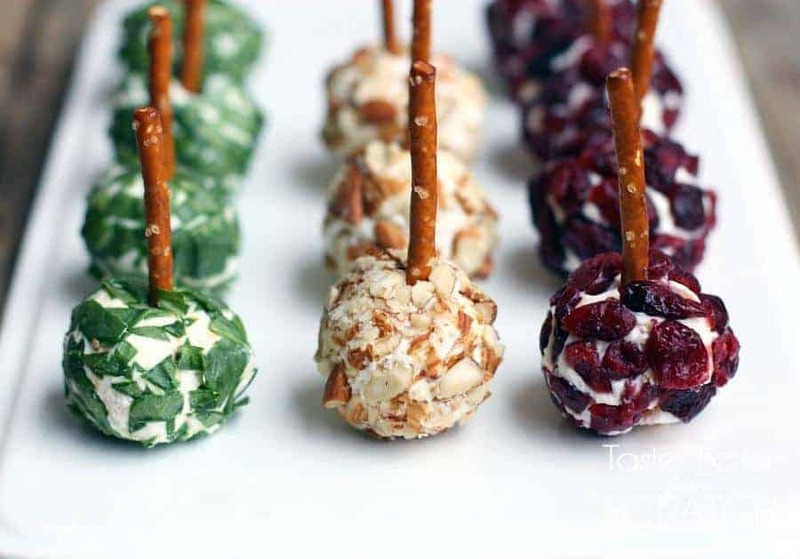 I love the idea of making them mini and adding different flavor components. Thanks for sharing! Did you try freezing them? I’d like to do the same. Yes they do freeze well. I did so at Thanksgiving. I wrapped them in plastic, then put in a freezer bag. Thawed them in the fridge the night before. Thanks Cathy! That sounds like a fun party–I hope everyone loves them! Thanks for this idea! I just made them for book club that I am hosting tomorrow night. Quick question–I have them in the fridge now. Can I roll them in toppings 3 hours before I serve them? It says serve immediately after you roll in toppings but I have to take my daughter to volleyball practice before our party so wondering if it would hurt to roll in toppings and refrigerate for 3 hours before serving. Thanks! Hi Amy, that should be fine! Sounds like fun–hope everyone loves them! When a recipe calls for dried cranberries, I use the Craisin cherry flavored ones. They just taste better to me.